Confronted with fiercely determined resistance from all corners of Ethiopia, the Woyane regime has desperately resorted to its notorious and contemptible tactics of divide-and-concur<, genocide, and sinister power-sharing scam to abort a budding insurrection. Ethiopians in the Diaspora, opposition leaders at home and abroad, and backers of the criminal TPLF regime in the West have a moral responsibility to avert a human tragedy of biblical proportion in the Amhara and Oromo regions being perpetrated by a brutal dictatorship. In a last ditch effort to break the solidifying solidarity between the Amhara and Oromo people, the regime has now unveiled, through its mouthpiece Aigaforum, its intention to “… introduce legislation to make Oromiffa as official language besides Amharic in Addis Ababa, … in line with the special status of Addis Ababa as a region and its significance to Oromia region.” Obviously, the declared intention, which is preposterous at best and egregiously offensive at worst, does not pass a sniff test for sincerity. While there is no genuine Ethiopian who would have any qualms about instituting legislation to elevate in a just society the status of Oromiffa or the rights of the Oromo or any other ethnic group, the TPLF regime, which has massacred peaceful protesters, trashed basic human rights, and distinguished itself as one of the most repressive governments on the face of the earth, can no longer delude the opposition through appeasement and subornment at a time when it is cornered like a caged animal. Over the years, the TPLF thugs have been too inebriated by corruption and greed to heed Joseph Conrad’s words: "Your strength is just an accident arising from the weakness of others". The people of Oromo and Amhara have now firmly grasped that Woyane's accidental rise to power and atrociously unrestrained abuse of human rights have been enabled by the hitherto failure of the various groups to rise in unison to abolish the malignantly repressive system. The legitimate questions of the Oromo people, as well as the broader demands for democracy, can only get lasting and genuine solutions when the repressive and corrupt minority rule of the TPLF is abolished and a just system of government is established based on the universal principles of equality, fraternity and liberty. Therefore, this recent futile ploy by the evil regime to nip at the bud the emerging solidarity among the Oromo, Amhara and other ethnic groups should not be allowed to thwart the nascent uprising, thereby giving a dying dictatorship another lease at life. Over the last several months, the ethnocentric regime has unleashed its killing machinery, which is generously oiled by Western donors, and has viciously massacred defenseless Oromo and Amhara people, as it has recurrently done so against any group it has perceived as a threat since its inception in the bushes of Tigray. The West, blinded by a myopic and puerile policy of sacrificing long-term stability and democratic governance in favor of short-term alliance against extremism, is shamelessly watching as the brutal TPLF leaders let loose their destructive forces against peaceful protesters in the Oromo and Amhara regions. Paradoxically, President Barack Obama has yet to officially comment on the vicious killings of Oromo and Amhara victims by those very criminals he brazenly praised as democratically elected. This has come as a shocking surprise even to those who are in the know about the close ties of his National Security advisor, Susan Rice, to the Woyane regime and her fanatical worship of the late Meles Zenawi. The hundreds of thousands of Ethiopian Americans, who overwhelmingly voted for Barack Obama in the last two elections, are carefully watching whether Democratic presidential candidate Hillary Clinton would have the moral backbone to atone for past sins by officially denouncing the killings of Amharas and Oromos by the dictators, who had once paid, through their agent Mohammed al- Amoudi, $20 million in a quid pro quo to the Clinton Foundation. Today, the people of the Amhara region are being slaughtered with impunity by a ruthless army that is trained, advised and modernly equipped by the Pentagon. However, there is no force that can permanently stop an uprising of the kind that has manifested itself in the regions of Gondar and Gojjam. In fact, history is a witness that the genocidal actions of the dictators and the immoral silence of their Western backers would only lead to a continuous and violent recrudescence of the upheaval that is now shaking the very foundation of a jumpy dictatorial regime. On another front, the regime is busy formulating a sham scheme to attract the attentions of gullible opposition leaders through a power-sharing maneuver. The idea, apparently espoused by worried U.S. State Department career bureaucrats, is again a reincarnation of the same old and deceitful policy that the regime has used to prolong its repressive rules for over two decades. Opposition groups should be under no illusion that a just system could be established through a power-sharing arrangement with a criminal regime. An authoritarian government that has committed crimes against humanity, destroyed the national fabric of a nation, and plundered the meager resources of a defenseless people, cannot be trusted to cohabit in a democratic framework with those it has abused for much too long. Today Ethiopia is at a crossroads. Hardened by decades of repression, abuse and injustice, the people have risen in their ferocious and determined might to deal the Woyane dictatorial rule a fatal blow. It is high time for the Western sponsors of this criminal and failed government to stand with the people, and support the revolution to end an era of human suffering and repression. By all indications, the end is in sight for the minority regime whose guiding philosophy is engrained in deception, corruption, treachery, criminality, brute force and a dated principle of divide-and-rule. The judgment of history would also be equally harsh against those in the opposition who may fall in the traps of Woyane, tempted by the lure of power sharing, and serve as unwitting accomplices of the dictators to thwart the people’s march to victory. The indefatigable Ethiopians in the Diaspora should continue their vigil, and use their electoral might to force national and regional candidates to take stand on the emergent human tragedy perpetrated by the TPLF ethnocentric regime against our compatriots in the Amhara and Oromo regions. 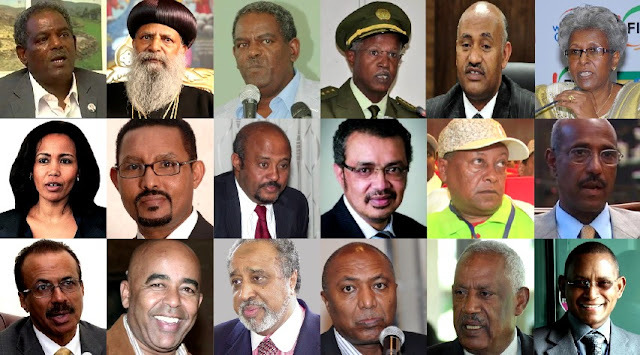 Indeed, as we are attempting to do so through a copy of this communication, there should be a sustained effort to nudge candidates for political offices in the U.S. and elsewhere to call for the prosecution of all TPLF leaders who are responsible for the genocide and suppression of human rights in Ethiopia.